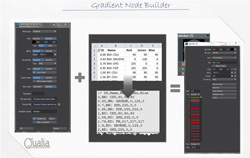 Quickly build complex gradient nodes according to your needs with Gradient Node Builder. Ideal for texturing instances, e.g. to visualize statistical data or decorate a starship's cockpit. Run Gradient Node Builder, define all general setting in the panel and specify the remaining properties in a spreadsheet or text file. Your desired node is instantly built based on panel settings and file content. Avoid the creation of tiny quads and create a cleaner polygon flow with Six-points-to-four-quads. The plugin is ideal for modelling 3D Text with subdivision surfaces (SubDs). Select a multiple of six points (selection order does not matter!) that make up end caps and run the plugin. For each set of six points a four-quad configuration will be created - as suggested by William Vaughan in his book [digital] Modeling.